TURN once, or turn often? Which pan is best? Does resting really matter? Masterchef’s favourite son, Adam Liaw touched on some of the eternal topics that typical home cooks agonise over when trying to cook the perfect steak, during a lively presentation at the Angus Australia national conference in Ballarat last week. The celebrity chef, who has one of the largest social media followings of any food identity in Australia, suggests there is no single ‘right way’ to cook a steak, but much of it comes down to personal preference and what the chef is seeking to achieve with a given piece of meat. He said when he goes to food festivals or events where demonstrations are involved, visitors ‘could not be more interested’ in any topic, than how to cook a steak. 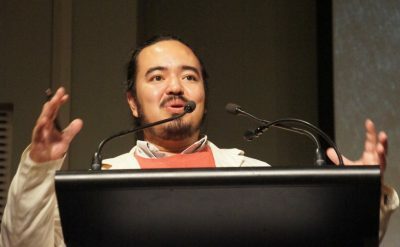 What was impressive about Adam Liaw’s presentation at the Angus conference was not only his obvious passion for food and how to prepare it, but also his deep understanding of the science behind cooking – the principles of physics and chemistry, such as how and why different proteins react to different temperatures, and different types of heat. He told the audience that what happens in a typical Australian home kitchen at seven o’clock on a Tuesday night was a difficult thing to understand. “It’s incredibly prejudicial – we never get to see it. Consumer sub-groups range from the ‘passionate foodie’ to the ‘disengaged quick-fixer’ and another three or four groups in between. Some consumers drift between groups,” he said. Surveys showed the average Australian household regularly cooked just five regular dishes for the everyday weekly evening meal. “I produce hundreds of recipes every year, but people aren’t likely to change that habit. But what they do want is to be able to cook those five or so items better, or slightly differently,” Adam said. “The most popular you tube clip I have is beef and broccoli with oyster sauce. It’s not innovative, or even interesting to some, but it’s about regular Tuesday night cooking. And it’s about doing it a little better,” he said. As premium food producers, the beef industry needed a very clear idea of what sets its product apart from others on the supermarket shelf, Adam said. “Is it healthier than other options? More ethical? Easier to cook? Cheaper? Probably not, given the current price of beef, but there are plenty of opportunities to differentiate a more expensive product like beef, from other proteins,” he said. Adam made the point, using website traffic analytic figures, that of the ten most popular recipes listed among his SMH/Melbourne Age Good Food website columns, one was a dessert, two were chicken recipes, one each lamb and pork, and five were vegetarian. None in the top ten were beef-based. “You might think that’s terrible news, but I’d argue the opposite. People aren’t searching for beef recipes – not because they don’t like beef, but because they already think they know how to cook it. The reason consumers look for recipes is that they’re not sure how to cook the product. That’s the reason five of the top ten were vegetarian,” he said. Adam suggested that at this time of year, consumers were looking for heartier-type beef meals, and it was part of the reason why consumption of beef tended to rise over winter. “The dishes that we associate with beef at this time of year tend to be slow cook styles. Obviously consumption is going to rise when you have a piece of chuck steak – not only quite cheap, but also very tasty – slow cooked in a casserole. “But as Angus beef producers, you are in an incredibly good position,” he said. Adam said beef meatball recipes were not popular on his website pages. “People love meatballs, but it’s one step too far for a busy home cook, who is trying to prepare a quick mid-week meal. Recipe writers love them, but I don’t publish meatball recipes, because people just don’t chase them,” he said. That comment raised the issue of value-adding. Beef Central asked Adam about his views on whether beef deserved its reputation for being a more ‘challenging’ protein to value-add than chicken or pork. “Diversification of cuisines is perhaps part of the answer. Mexican is growing rapidly, and marinated thinly-sliced beef, which cooks quickly for a fajita, is an obvious choice. “Most value-added products will be from smaller cuts of meat. But some of it currently is awful – stir-fry beef strips in supermarkets, for example. If you get stir fry beef in China or other parts of Asia, it is cut extremely thinly, and takes just seconds to cook. What we see in Australian supermarkets is thick strips, which I don’t know how you could cook without being really rubbery,” he said.